Community Literacy of Ontario (CLO) is a provincial literacy network of 100 community literacy agencies across Ontario. 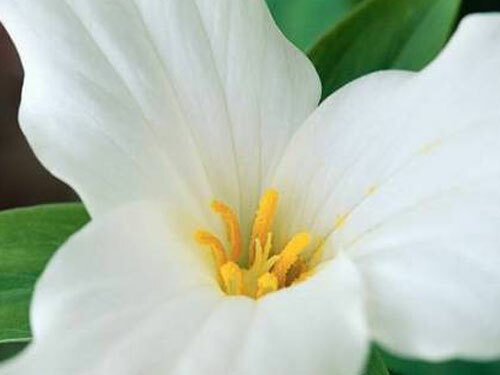 CLO was founded in 1994 and our office is located in Barrie, Ontario. We provide many services to Ontario’s literacy community such as: creating and sharing information via e-bulletins, newsletters, resource guides, our website, and via online and face-to-face training events. CLO has invariably attracted people with vision, dedication and commitment. We are proud of our dynamic board, staff and volunteer team. While CLO may be small, we have always dreamed big, worked hard, and accomplished much. Community Literacy of Ontario has truly become the little organization that could. 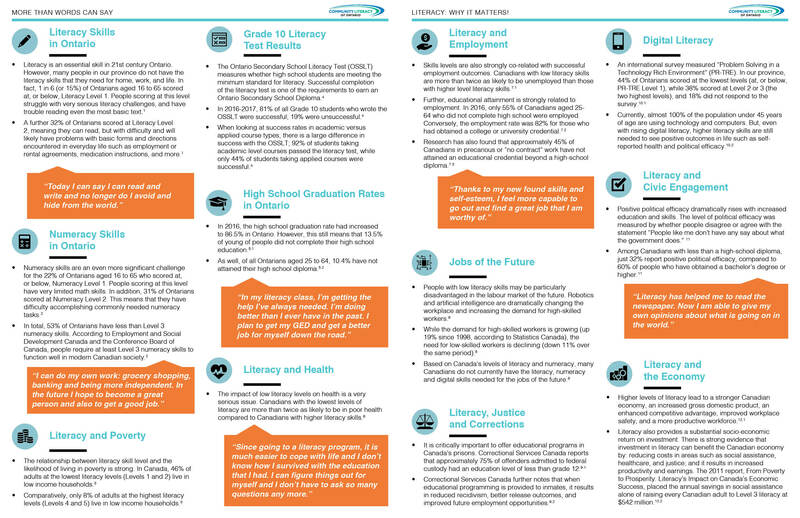 Community Literacy of Ontario is a network of over 100 community-based Literacy and Basic Skills agencies located in communities large and small across the province. 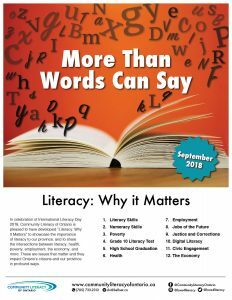 “Literacy: Why It Matters” 2018 launched September 4th, 2018 – read it for free in the links below! We hope that “Literacy: Why It Matters” will be a useful tool for our members, partners, community stakeholders and service deliverers, governments and the general public. Please feel free to use and share this resource in ways that are helpful to you and your community. NEW! Print version with space for your organization’s information and/or donor printer information! We’ve added space to the back cover so you can include your own information and even the information of the printer who donated their printing services! Click here for graphics that you can reuse and share! We’re taking each statistic from Literacy Why it Matters 2018 and turning it into a visual graphic, perfect for sharing on social media. Please feel free to save, share and reuse these graphics. You can also find them on our social channels where you can like, re-post and share the graphics. 1. Skills in Canada: First Results from the Programme for the International Assessment of Adult Competencies (PIAAC). 2013. Statistics Canada. (Page 17). 2. Skills in Canada: First Results from the Programme for the International Assessment of Adult Competencies. 2013. Statistics Canada. (Page 21). 3. Insights on Canadian Society: The association between skills and low income. Statistics Canada. February 2016. Andrew Heisz, Geranda Notten, Jerry Situ. 4. Infographic: Ontario Secondary School Literacy Test, 2017 Results. 2017. The Education Quality and Accountability Office. 5.1 2016 Graduation Rates Across the Province. May 8, 2017. Ontario Ministry of Education. 5.2 Education Highlight Tables, 2016 Census. November 23, 2017. Statistics Canada. 6. Special Report: Canada’s literacy and numeracy challenge worsens. December 12, 2013. TD Economics. Craig Alexander and Jonathan Bendiner. (Page 7). 7.1 OECD Skills Outlook 2013: First Results from the Survey of Adult Skills. 2013. OECD Publishing. 7.2 Education indicators in Canada: An international perspective. Statistics Canada. December 2017. 7.3 The Health and Social Dimensions of Adult Skills in Canada: Findings from the Programme for the International Assessment of Adult Competencies. Council of Ministers of Education, Canada. 2018. Linda Jacobsen and Andrea Long. (Page 77). 8. Canada’s Top Barriers to Competitiveness in 2016. February 2016. The Canadian Chamber of Commerce. (Pages 14-15). 9.1 Offender Education Programs and Services. February 2015. Correctional Services Canada. 9.2 2014–15 Departmental Performance Report. 2015. Correctional Services Canada. 10.1 Skills in Canada: First Results from the Programme for the International Assessment of Adult Competencies. 2013. Statistics Canada. (Page 84). 10.2 The Health and Social Dimensions of Adult Skills in Canada: Findings from the Programme for the International Assessment of Adult Competencies. Council of Ministers of Education, Canada. 2018. Linda Jacobsen and Andrea Long. (Page 29). 11. The Health and Social Dimensions of Adult Skills in Canada: Findings from the Programme for the International Assessment of Adult Competencies. Council of Ministers of Education, Canada. 2018. Linda Jacobsen and Andrea Long. (Pages 24-25, 47). 12.1 Smarten Up: It’s Time to Build Essential Skills. June 2015. The Canada West Foundation, Centre for Human Capital Policy. Janet Lane and T. Scott Murray. 12.2 From Poverty to Prosperity: Literacy’s Impact on Canada’s Economic Success. 2011. Canadian Literacy and Learning Network. Looking for an older version of Literacy Why it Matters? 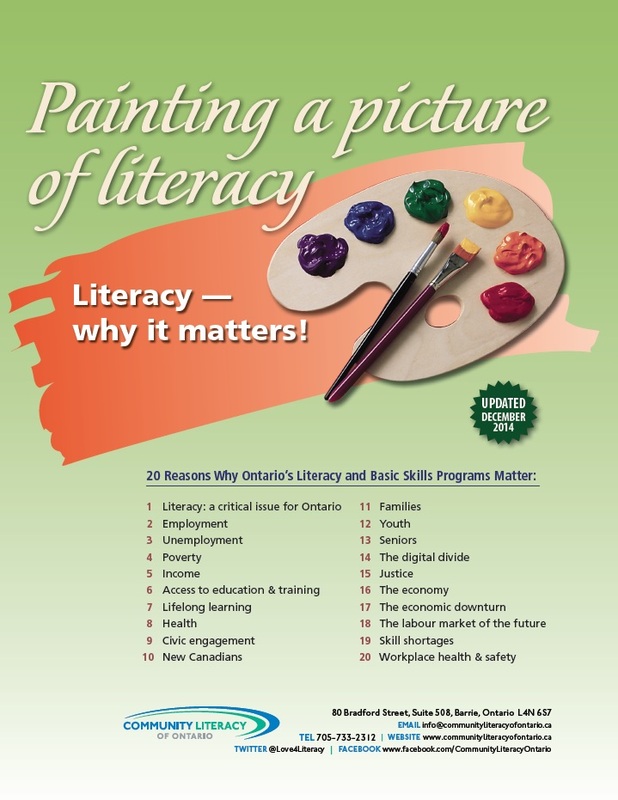 Download “Literacy: Why It Matters” December 2014 here. 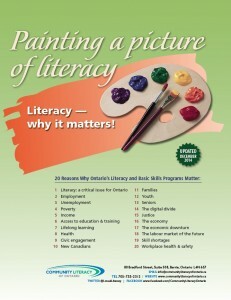 Download “Literacy: Why It Matters” February 2013 here.